Painting your rooms can revive the beauty of your space and give a fresh new look to the otherwise boring rooms. In fact, it forms a part of the maintenance of your home and must be done once every one or two years. However, the bad part is the immediate consequence of painting a room, that is, to be more specific, the suffocating paint odor. The paint smell can get really irritating, more so if you are painting your interior space. Although it is always advised to have good ventilation with open doors and windows, in some cases it is not possible, which makes the week after the interior painting job very disturbing mainly for those who are cursed with a sensitive nose. Do you also face the same problem and are worried about how to remove paint smell after painting a room? 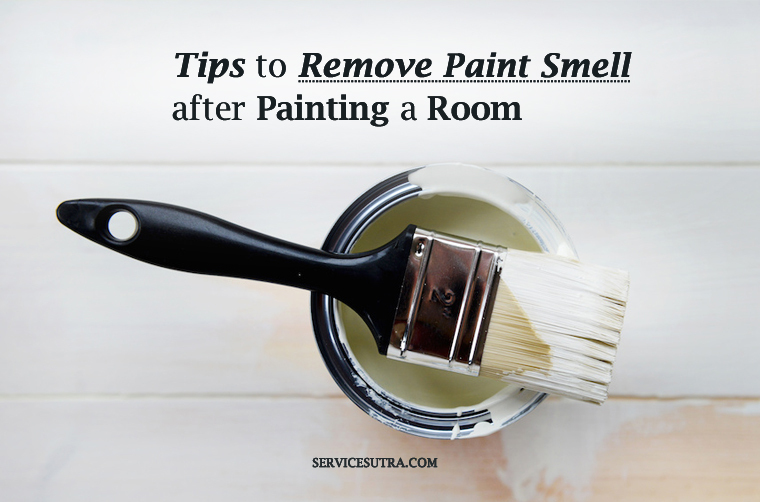 Well, in that case, keep reading this post for I am going to share an extensive list of 24 tips to remove paint smells after painting a room. These hacks can seriously help you get rid of paint smells easily and quickly. Most paints, as reported by the “US Environmental Protection Agency (EPA)” contain chemicals in it. The material with which the paint is made, together with the solvent used to make the paint liquid so that it can be easily applied with the brush, stays on the wall even after the paint dries. It is the evaporation of this solvent, which leads to the suffocating odor. The smell disappears once the solvent is fully evaporated but that takes around a week’s time and you have to tolerate the smell lingering around for several days. In case of the professional painters, who are exposed to excessive paint odors for a prolonged period, can have severe liver, kidney and nervous system issues. Even the laboratory animals can be infected with cancer or developmental and reproductive problems due to the chemical-based paint odors. Now that you have known how harmful the toxic paint smell can be, it is always better to get rid of the smell as early as possible. So let us start our discussion with some of the easy and simple tricks on how to remove paint smells quickly. With advanced technologies of air purification and paint formulation, things have got much better than before. But still in order to be fully safe, it is better to get rid of the pain smell as soon as possible. And if you are wondering about how to remove paint smell then here are the simple yet effective tricks to remove paint smells. The tricks discussed here are not just effective but are also natural and safe. I myself have tried many of these tricks and it works like magic. Charcoal is good in absorbing foul odors. Therefore, you can place buckets of crushed charcoal in your home mainly on the portions where paintwork has been done. Within an hour, you will find significant decrease in the suffocating odor. In fact, in order to get instant effects, you can also place them in the room just before the painting begins. You can use this easily available and inexpensive baking soda to eliminate the paint smells. Simply place few small bowls full of baking soda near the freshly painted rooms. Keep them overnight for the smell to get absorbed fully. Keeping shallow bowls with water and half cup of baking soda is also a good idea to get rid of the foul smell. However, in case of carpeted rooms, you may sprinkle baking soda over the carpets, let it stay night long, and vacuum them up in the morning. Onions may have a pungent smell of their own but they are very effective in removing the foul toxic smell of the paints. Take two onions and slice them into halves across the rings. Then place the halves in separate bowls with the cut side upwards. Put the bowls near the rooms where painting has been done. Keep them for several hours for the smell to get absorbed and then throw them in the dustbin. This is one of the most effective tricks to remove the paint smells. You have to take a bucket of water and drop few lemon slices in it. Then keep it in the room while painting is going on. You may add a pinch of salt and keep it overnight in order to get best results. In the morning you will find the toxic smell gone leaving behind a fresh lemony odor. If you want to remove the stinky toxic smell of the paints, you may also use vinegar that is an effective odor neutralizer. All you need to do is to keep bowls of vinegar in the room where painting has been done. Vinegar will slowly absorb the suffocating smell and make the air fresh and chemical free. Coffee grounds are good in removing the paints smells. You need to keep coffee grounds in bowl throughout the room. Slowly you will find that the toxic odor gets absorbed and your room is filled with the aroma of coffee grounds. This has to be counted among the unique tricks on how to remove paint smells fast. Well yes, you heard it right; candles can help you get rid of the toxicity of the paint odors. They burn the inflammable components solvents and hence remove the foul odor. Firstly, you have to light a candle and put it in a bowl full of water. Let it stay for few hours for the stink to lessen. Within few minutes, you will start feeling the difference. You may also use odor-eliminating candles although the ordinary ones are also very useful and effective. However, be careful while handling the candles especially when kids are around in order to avoid any accident. You may use vanilla or peppermint extract to get rid of the paint smell. The smell of both vanilla and peppermint is strong enough to eliminate and cover up the suffocating toxic odor of the paints. You can put few drops of peppermint oil or vanilla extract on cotton balls and place them all around the rooms while painting your interior space. Alternatively, you may use them in mixture of water as well to get good results. In fact, adding few vanilla drops in the paints before using them also lessens the foul smell. Simply keeping water buckets can also do the trick. The water absorbs the solvent vapors and eliminates its strong foul odor. The more number of water buckets you keep near the freshly painted room, the faster will be the process of eliminating the paint smell. The inflammable outer shell of the coconut is often used in rural areas to get rid of mosquitoes and you can use this familiar trick to remove the paint smells. Burning the dry coconut shells gives a strong smell that is capable of covering up the paint smell and henceforth can give you instant relief. There are few herbs like basil or rosemary that has strong odors and can help you remove the toxic paint smells. You may temporarily shift your plant tubs in the interior of your home to counter the suffocating paint smell. Camphor and naphthalene can also be used to get rid of the paint smells but as they are poisonous, keep them away from little kids. Also, do not overdo the usage of camphor, as it may choke you. Apart from using the above-mentioned tricks on how to remove paint smells using the common household ingredients, you must keep in mind some other ways using which, you can avoid the suffocating paint odor. Proper ventilation is very important to get rid of the paint smells. Keep your doors and windows open during the daytime and let the natural breeze enter your rooms. You can place an electric fan facing an open window to direct the paint smells outside. Good sunshine is very favourable to get rid of the stink. The paint fumes occur mainly due to the dampness and humidity, so the faster the paint dries, the better for you. Therefore, never paint at night. Go for low or zero VOC (volatile organic compounds) as they have much less paint smells. Most paints in recent times have low VOC, but in order to get rid of the toxicity, zero VOC paints are the best. Make sure you do not use alkyd or oil based paints and primers. However, if oil based primers are very much needed, then go for the low odor ones. You may also choose waterborne primers that despite being latex based acts like alkyd paints. Another good option is to go for natural paints made of clay, plants, milk or minerals. It is best to avoid painting too many rooms at a time, as you might feel locked out until they dry. Besides, inhaling excess of paint smell all at a time is not good for health. Always apply new coat of oil or latex paint after the last coat dries. This is because the damp coats of primer or paint remains trapped underneath the dry coat and can emit toxic gases slowly for several years. In case of rainy or humid weather, give more time to the paint to dry up fully. Whenever you are using the kitchen ingredients like onions, lemons, coffee grounds, vinegar etc to get rid of paint smells, remember to throw them post usage. Make sure you do not use them for cooking purposes as they contain all the toxic chemicals absorbed in them. Keep the paintbrushes covered with plastic bags when not in use. Try to keep the paint containers covered with their lids as much as possible. While painting one particular room, try to keep the doors and windows of other rooms closed to avoid the paint smells from spreading fast. Place them outside when they are not used. There are many who have not done interior painting for several years just to avoid the toxic paint smell. Well, I understand their concern and it is true that the paint smells are harmful and has many side effects like headache, dizziness to more serious ones like lung, eye, throat, liver, kidney damage etc, all of which I have already discussed in this post. But do you really think that not painting your home for several years is really a good option? Frequent painting must be done not just to make your rooms beautiful but it also forms a part of maintaining your home. Instead of avoiding painting your home, what you need to do is to use the right paint and know the right tricks to remove paint smells after painting a room. In order to keep the toxic smell away, use the zero VOC paints and avoid the oil based paints and primers as much as possible. Keep your rooms airy and use the common kitchen ingredients like onions, lemons, coffee grounds, vinegar, vanilla, water, peppermint etc to get rid of the paint stink. Follow my other instructions and keep yourself safe from the toxic chemical emissions. Are you planning to paint your rooms? Have you noted down all these hacks to remove paint smells easily? I hope that you all benefit from today’s post. Do share me your queries and feedback in the comments below. Also, do not forget to like and share if you find it beneficial. Until then stay informed and paint your home using safety measures.